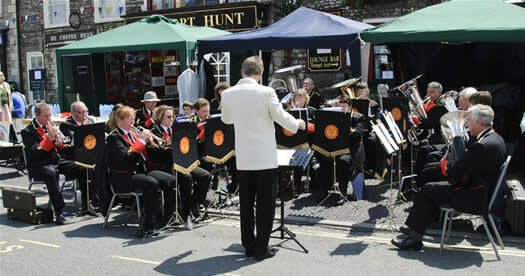 The Band was formed in 1996, the idea being to create a Band for the benefit of the local community. It aimed to enhance and widen the scope of musical opportunities, especially for younger players, within the Parish of Dodington but also throughout the Dodington, Yate & Chipping Sodbury areas. We have a wide range of ages and musical abilities, including very experienced as well as new and returning players. We find this mix works well and ensures help and encouragement for our younger or less experienced players. We are non-competing Band, and have no plans to compete. We do take part in a wide range of musical engagements throughout the year such as local fetes, garden parties or specific concerts that we arrange ourselves, where we play a varied programme of music. We try to work as closely as possible with other Bands in the area and hope that we create an atmosphere of co-operation and friendship. Feel free to pop in and see us any Tuesday evening from 7.30 pm even if just visiting the area. The Band practices at the Dodington Parish Hall which is situated in the grounds of Raysfield School, in Finch Road, off Heron Way. The postcode is BS37 6JE.